We all know that we need to keep the site fresh, adding quality, interesting and informative content on a regular basis but, it does not matter how much great content you have, how funny, clever or valuable it may be, you have to drive traffic to the site so that they get to see it, read it and learn to love and appreciate it. Once they do then they will come back. To get your website in front of people that are interested in your subject matter and message, you also need to get yourself out there contributing on other websites that have a lot of traffic. Registering and contributing to forums, commenting on blogs, joining groups and social media pages and adding to the conversation, answering questions on yahoo answers will all help. This takes time, a lot of time. You can also submit your content to many different websites that get huge amounts of traffic like reddit, tumblr, stumbleupon and wordpress to name but a few. If people like what they see on these third party sites then they will hopefully click through to your site to see more. Once they get to your site then, if they like it, they will read a bit more and maybe sign up for your updates or to get your free offer and, over time become loyal subscribers. If you keep doing this then eventually your traffic will grow to a level where you can make it profitable and generate a life supporting/changing income from it. Of course, the sooner you can get to this critical mass of followers the better. And, I can help you with that. 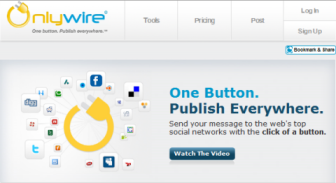 Services like onlywire can help distribute your blog posts and content to up to 50 different social media websites. You can also send to multiple accounts on each of those creating an almost infinite number of links back to your site. Now the key here is NOT to get the links, although that is an additional benefit. If you are trying to improve your SEO then this is not the best way to do it. The reason to use this service is to increase the exposure to your content, getting people back to your site. By sending out to 50 or more social networking and bookmarking websites every time that you write a post or add content then you will get more traffic. Also, if people like what they see, they will also share it, especially if you encourage them :-). Look at it as a kickstart, starting the ball rolling to hopefully gain momentum. Once you have that critical mass then your site will take on a life of it’s own and you can stop all of these shenanigans to concentrate on producing more stellar content for your readers and cash paying customers. Some other Social media submission services to take a look at. I will be doing an in depth video on the different ways to drive traffic to your website including the methods described in the QSC plus a few more. In the meantime please add your comments below and, if you think this article is interesting and informative and has been of help to you then if you would be kind enough to share it I will be eternally grateful. FOR SOME REASON ONLY KNOWN TO THE GODS AND MAYBE THE TOP WORDPRESS TECHNICIANS MY COMMENTS ARE REFUSING TO COME OUT TO PLAY AND HAVE DECIDED TO PLAY HIDE AND SEEK. A GAME THAT THEY APPEAR TO BE VERY GOOD AT. I AM STILL LOOKING AND WHEN I FIND THEM I WILL MAKE SURE THEY ARE PLACED BACK WHERE THEY BELONG UNDERNEATH ALL OF MY POSTS. I AM HAPPY TO ANNOUNCE THAT THE COMMENTS HAVE RETURNED AND ARE NOW IN THEIR RIGHTFUL PLACE AND BEHAVING IMPECCABLY SO, FEEL FREE TO POST AWAY ..
Let me know your thoughts and feedback. I like your subscribe button. Since yesterday I have on my blog at herzensleben.de- a very nice subscribe optin in the right sidebar- perhaps you an inspirational look . I like your page Jochen and although the squeeze heading takes up a lo of space, it is not in your face. Very clever design I thought. Design is definitely one of my biggest weak points. Lloyd, great post. Thanks. What I ask myself when I hear for automation is where starts spam and banned accounts. Have great day! Using automated software for scheduling is not going to be a problem as long as you dont abuse it. You can setup a months worth of posts to be posted at a time and day when you will get the best response. The problem with automation is when it is used to spin and spam comments on blogs and just adding crap to the internet. Onlywire simply gets your hopefully, quality content out to more places to be seen by more people who, if they like it will visit your site and look at what else you have of interest to them. Hello Lloyd, I have just started to use Social sprout as a content curation tool. However it works wonderfully as a means to get your content out there as well. The trick is to mix your content in amongst the valuable content you have found on other sites that you think your audience want to know about. By doing this I have started to increase my follower count, now its just a matter of developing this further and monitoring the number of people that follow my links back to my site to read the full content. Many thanks for the tip. I will take a look at it and maybe give it a go. I also looked at outbrain today but this is a PPC type distribution. They display your posts and you pay if someone clicks on a post. Lloyd, I really enjoyed your post about Onlywire. It sounds like a great way to increase blog traffic. Thank you for the resource. I will be coming back for more.